Kicking of the new year! 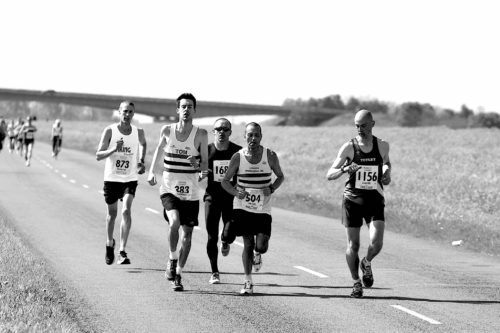 I have been running the North Lincolnshire half marathon for the past 3-4 years (albeit slowly ha) and the tape2tape.co.uk team have been putting on a great event on a great course. The locals also do their part including the kids from scouts and brownies at the feed stations. So I know the roads pretty well after running it previously. Its nice a flat, normally great weather and this year was to form part of the building for Ironman Austria (A-Race) and the Outlaw half (B-Race) later in the year. The day was dry but a little windy so decided where possible to tuck in behind anyone who is tall or larger packs where possible. The usual madness ensured with a massive amount of people running off at what must have been 5.30min/mile pace, by 5km in most of these jokers where already going backwards. Figure 1. Heart rate and pace over the North Lincs course. The take home was I had a great race managed to stick to pace of just over 6min/mile (Hr 164 – 93% of max) and rolled over the line at 1hr 18min 53sec. This was a new PB and gave me 29th overall and a first time podium in the old man’s age group (3rd V40). The day was a confidence builder to tell me training was paying of so next stop Outlaw middle distance triathlon, Nottingham.